It doesn't take long at all to see just how important central midfielder Jonathan Lao is to the Vaughan Azzurri. The self-assured footballer frequently helps set up attacks, takes free kicks, wins the ball, and - eight times this season - has found the back of the net himself in League 1 Ontario Soccer action. Lao, along with Azzurri striker Andrew Ornoch, packs a formidable one-two punch for the Azzurri, and that was clearly on display in a recent 3-0 home field dismantling of the Kingston Cataraqui Clippers. Ahead 2-0 and about fifteen minutes into the second half, the pair smoothly switched positions with Ornoch playing the role of distributor and Lao finisher to get the final goal. It was Lao's second of the game and eighth of the season to make the final 3-0. Just turned twenty-one, the modest Lao gives credit to his teammates for his own success as second-leading goalscorer in the league after the August 3rd weekend's set of fixtures. Ornoch finished the matchweek tied for third with Emery Welshman, Alex Halis of Sigma FC and Lerohne Young of Durham United FC. 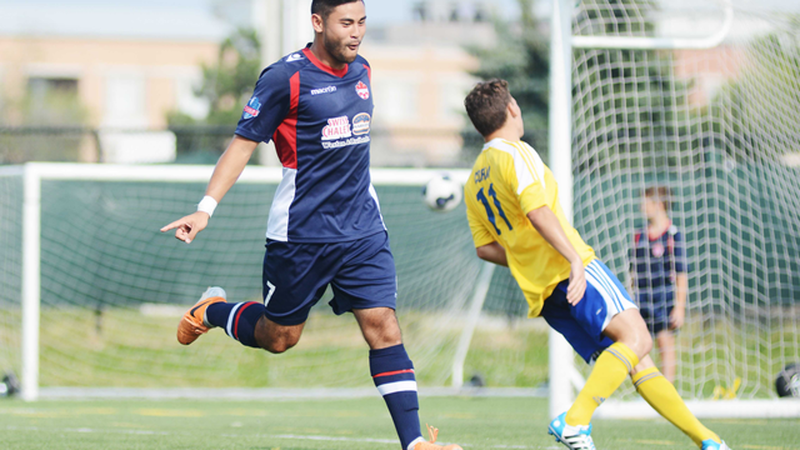 Molham Babouli of TFC Academy has a healthy lead on the rest of the league with 13 goals. "I think a lot of it is the chemistry we have had throughout the year. With the work we put in and with players like (Andrew) Ornoch, Joey Cicchillo (who has four goals) and others, we work well together," said Lao. "They know how to create space for everyone," he said. Lao, a Markham native who still lives in the Toronto suburb, came to play in Vaughan this year after a request came from the coaching staff. "They asked if I wanted to come here to play and I agreed. It's worked out well," he said. A former TFC Academy player who was part of the TFC program for four years until about three years ago, Lao left the academy after what he said was a bad season. He played for other clubs until trying his hand in League 1 this year. He has blended well with a strong Vaughan lineup that finds itself contending near the top of the League 1 table, pushing TFC Academy for the No. 1 position. Sigma FC has been the other standout team to this point, though Woodbridge, Windsor and Durham FC are all contenders as well. For Lao, on a personal level, he's hoping, "something will happen. I'm always pushing to become a full pro. I always hope something happens, but until then I'm just going to work hard and hope for the best." Lao and the Azzurri don't play again until Sunday, Aug. 17, when they have a home match at the Soccer Centre in Vaughan against Durham, 4 p.m. kickoff.